“Disappointing is the word. Empty is the other word.” – Mile Jedenak, Jun 26, 2018. Australia was always the outsider in the tournament, and a loitering one at that. Its fans, and loyal commentators, thought otherwise. In Kazan, the journalists gave the impression that the so-called Socceroos were Lotharios to be admired, wonders to be embraced. A story went around that Australia had become some substitute Netherlands side, a touch far fetched though enticingly sentimental. In Sochi, such sentimentality became hackneyed and wooden. Australia needed to beat another unfancied side, Peru, and hope for a good French performance against the other group member Denmark, to have a chance to scrape into the last sixteen. The exercise was ultimately an academic one: France failed to score against Denmark, as did Denmark against France. Peru and Australia would be leaving the tournament. When it came to the group matches, there were chances, means, and hopes garlanded with prospect. The Danes were struck by the fortitude of the Socceroos, both sides squaring the ledger after ninety minutes. Such is the nature of football and its arithmetically perverted odds: it distorts to a charming degree and affords comfort in the most unlikely of cases. 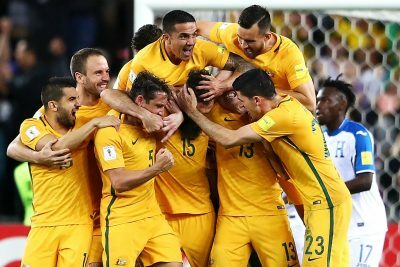 The reality is all too clear: the Socceroos have been flat. Be it in execution, delivery and generation, the team has been operating in discordant assembly, its barbs either hidden or totally absent. The gloriously bearded captain Mile Jedinak may well have scored from his two penalty shots, but finding a goal from open play has been less likely than a koala sighting in Kazan. Much of the commentary around the match against Peru was based on the suspended meaningless of a moment. Luck remains the emptiest of alibis in football, but it is appealing as a refuge of last resort. The old tricks of the disgruntled show find their place: the performers who did well in a village styled pedestrianism but came up without the result; the injustice of the fine tuned shot (how dare they!) that penetrated and punctured all; and the sense of god awful luck; or its lack, if you are an Australian soccer tragedian. But the despoiler of the show was Andrew Carillo, who decided to shine when necessary. In the second half, Paolo Geurrero added another punch to the misery. As the gradual unravelling of a team was taking place, the side punditry was warming up: Would Tim Cahill play? Was he warming up? This is the soppy nature of World Cup feeling and Australians were feeling it in abundance. “A dagger in the Socceroos’ heart,” came another post on the Optus Sport Twitter feed, which is good to see, given that Optus proved fairly incapable of showing anything dagger related at all in broadcasting its complement of matches to Australian audiences. In terms of football, Australia remains a country in cryogenic storage, archived in the pocket of potential, the slot of future expectation. The same cannot be said about the women, who seem to have outdone their male counterparts by some stomping margin. The World Game, as it has been marketed through sporting channels in the country, has yet to globally impose its omnipresent sense upon the populace. There are still many competing codes. In terms of team make-up, there is no excuse why this population located at the base of Asia should not muster something that moves, at the very least, into the elimination stage of the tournament. Players such as the green but delightfully promising Daniel Arzani were kept back as delicate porcelain samples. Tim Cahill, the terror of set pieces and some delicious moves in the previous World Cup, was treated as a worn talisman who might, given the right moment, have emerged from wheelchair royalty. Deployed all too late, his appearance against Peru seemed but a meek and ineffectual swansong. In a World Cup where goals have come with graceful ease and fluency, Australia has struggled with shots. Build-ups did come, mounted with some grit and fortitude; there were even times in the drawn match against Denmark that suggested something of a blooding, a growing in confidence. But other teams wised up to the glaring disability, leaving the Socceroos as mutes before a noisy and insistent chorus. “We played well,” came the redundant summation from former Socceroo John Aloisi, “we were the better team tonight.” Cries were registered at the final whistle that the first goal from Peru was inflicted from an offside situation. But what mattered was that Peru did score, which will be etched in sporting history. Same with France in its narrow victory, helped by the freakish nature of providence itself. In the context of tournament matches, that is all that matters.